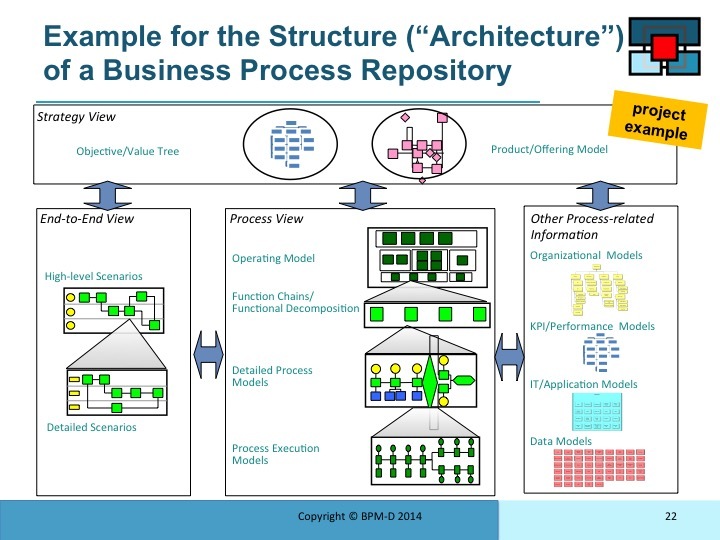 Having given you an overview of the framework in the previous section, this module covers some of the most important components of the model in a bit more detail. 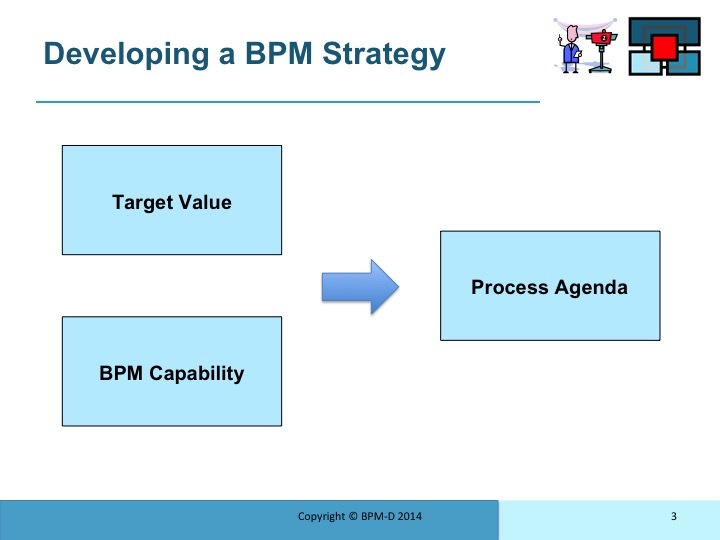 As described previously, the process of process management is one of the central aspects of a good BPM-Discipline. The starting point is a robust process strategy or, as we like to call it, “execution strategy”. 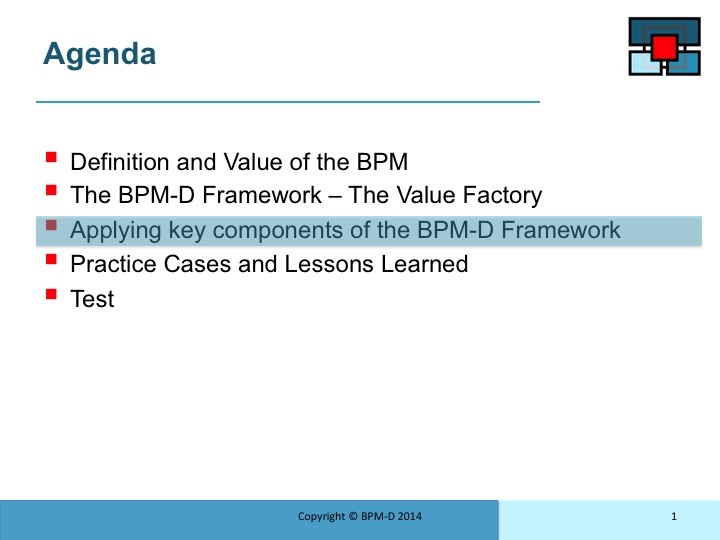 In developing the BPM-Strategy and the key value drivers. 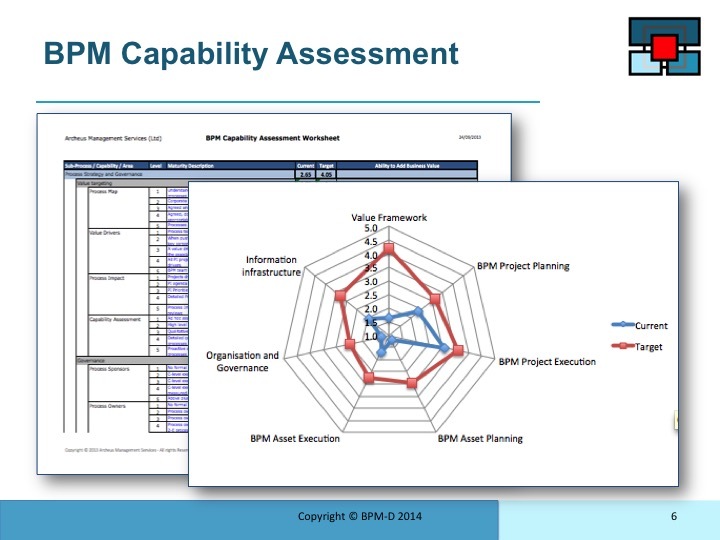 We match these with an assesment of the organisations BPM capability to determine the process agenda.This is detailed on the next few pages. 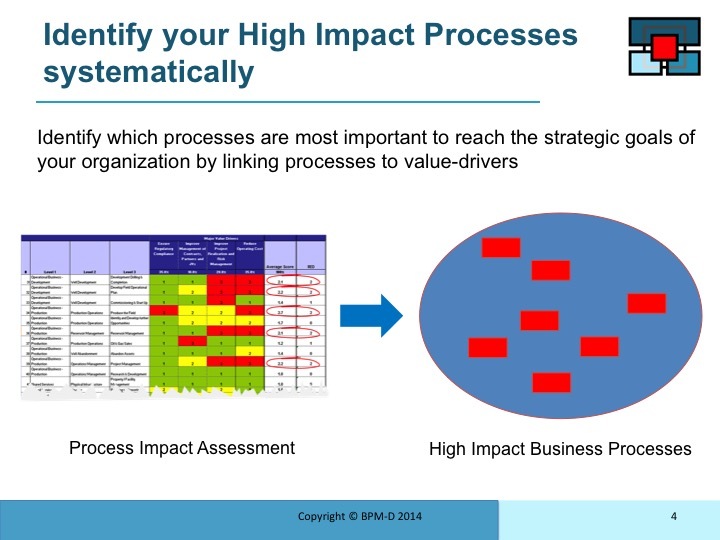 Using a Process Impact assessment (PIA) we identify the high impact processes. 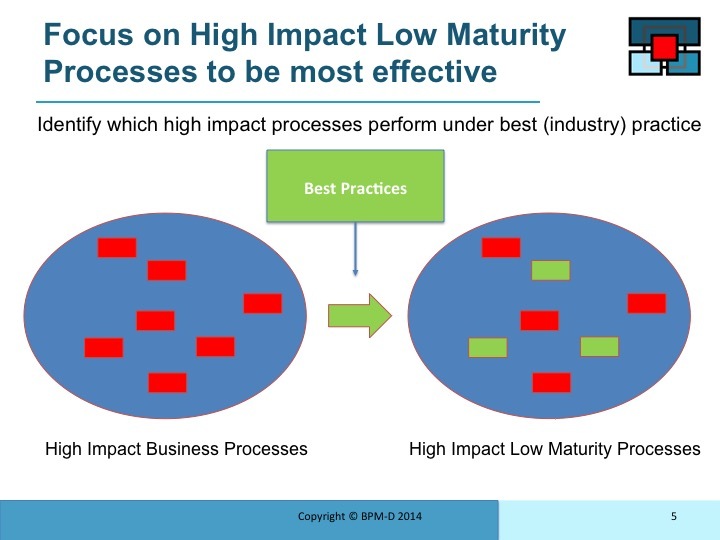 Those processes, as shown in the matrix, that are assessed as having the most important impact on the priority business value drivers. We then analyse these high impact processes to identify those wich have the lowest maturity where we identify and prioritize appropriate interventions. Before creating a process agenda we first asses how good the organisation is at process management. Identifying gaps in BPM capabilities allows us to plan interventions that the organisation is able to execute while continually enhancing bpm capability. The resulting process agenda then includes prioritized waves of activity that are outcome based (above the water-line process improvements) and sustainable (below the water-line capability improvements. 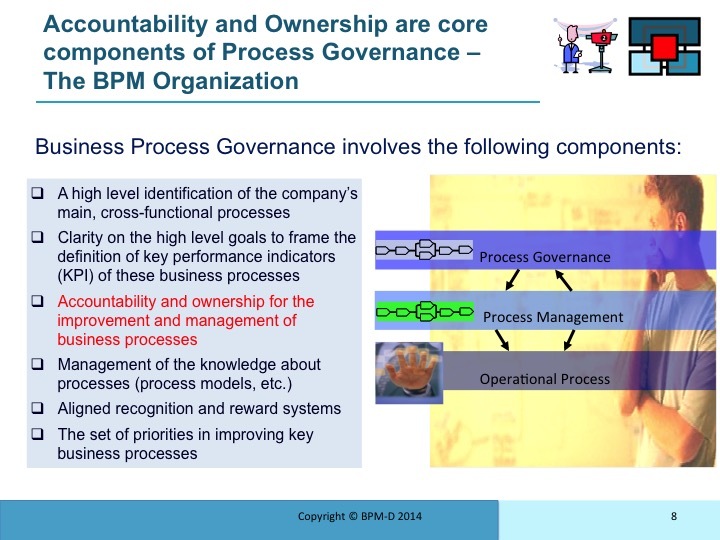 The second area that is critical to a functional BPM-Discipline is the process governance. Whos is responsable and involved in changing what processes when. Adding this dimension of accountability and ownership to, already complex, organisation structure needs to be done, with thought across various levels. 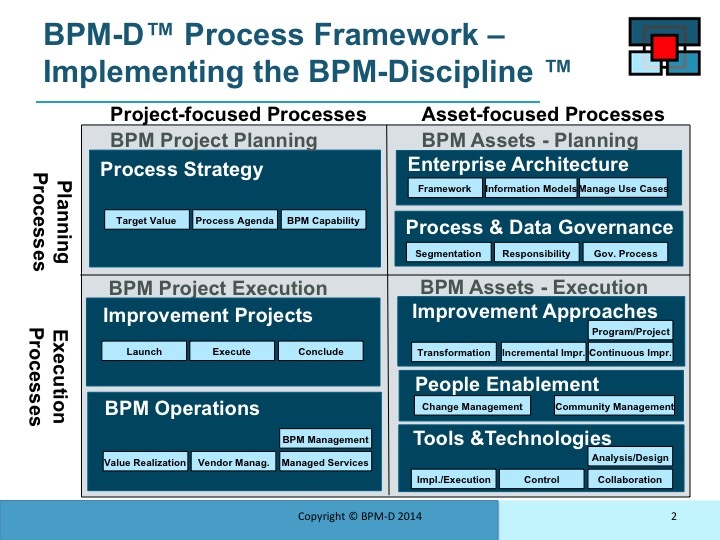 Central to an effective BPM-Discipline is the right leadership. 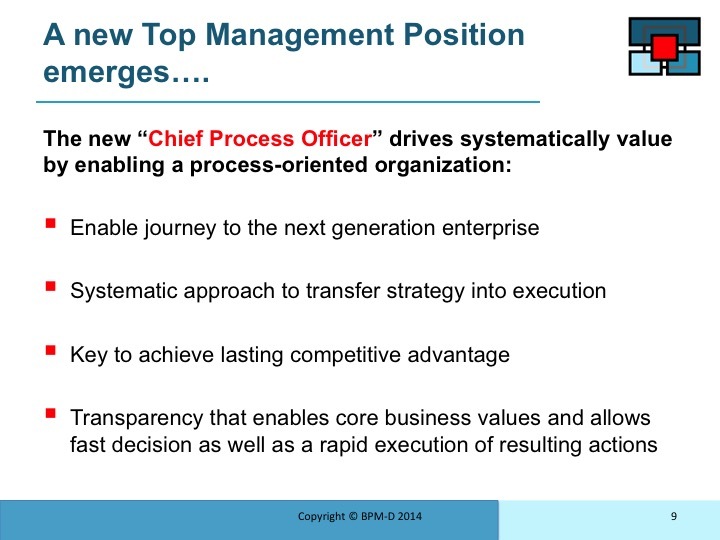 the role of CPO is emerging at the board table to take this responsibility. 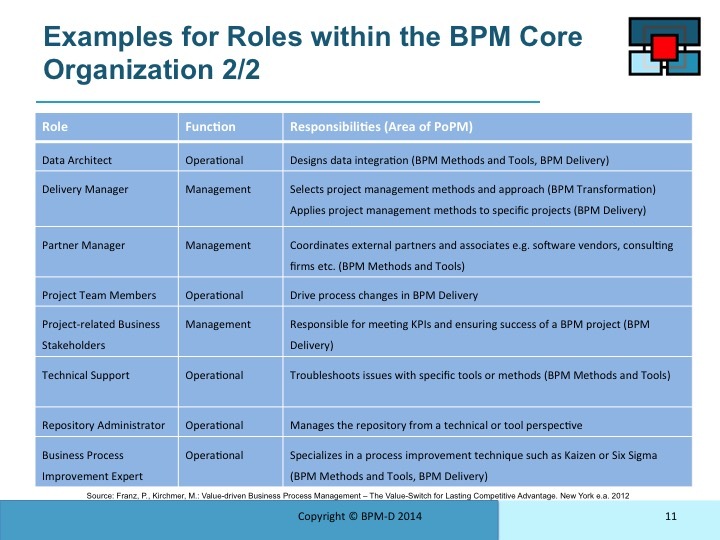 There are many other BPM roles that should be identified across the organisation some of the more typical roles are listed on these two pages. 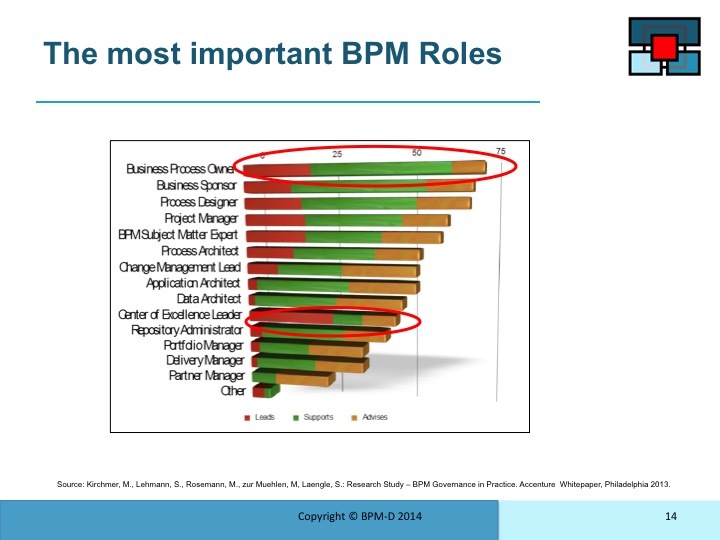 Not all of these roles need to be present and they will be added to meet the business with growing BPM maturity. 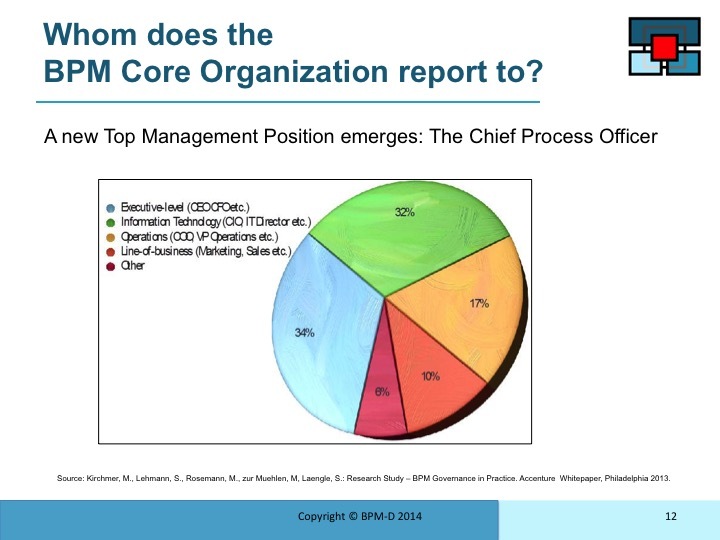 Beyond the BPM roles there are many other elements to be implemented while building an effective process central culture . One of the most important BPM roles is the process owner. This individual co-ordinates all activity around each end to end process. Not all sub processes are treated in the same way. 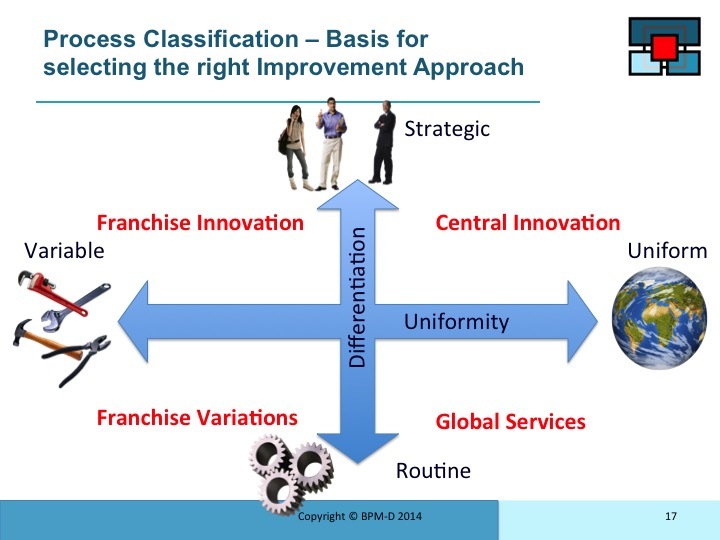 To understand this we look at process classification and two major dimensions. 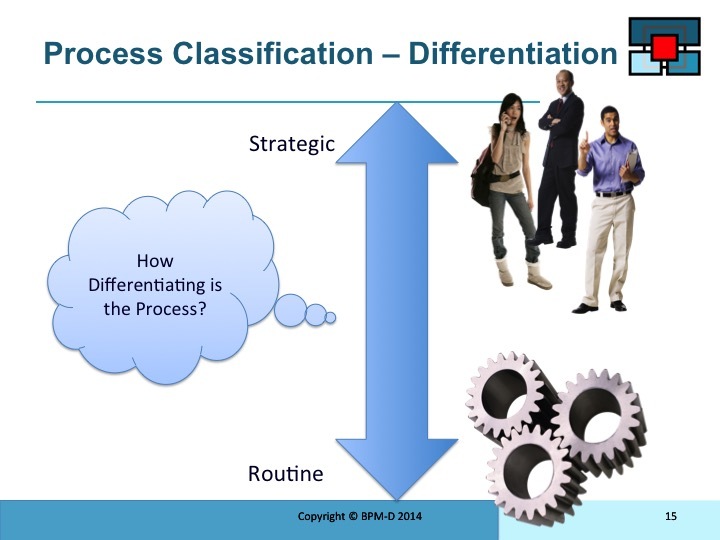 The first is the strategic differentiation of the processes. Is it one that is very visible to the customer or more routine and in the background. This dimension of process classification is probably the most difficult. 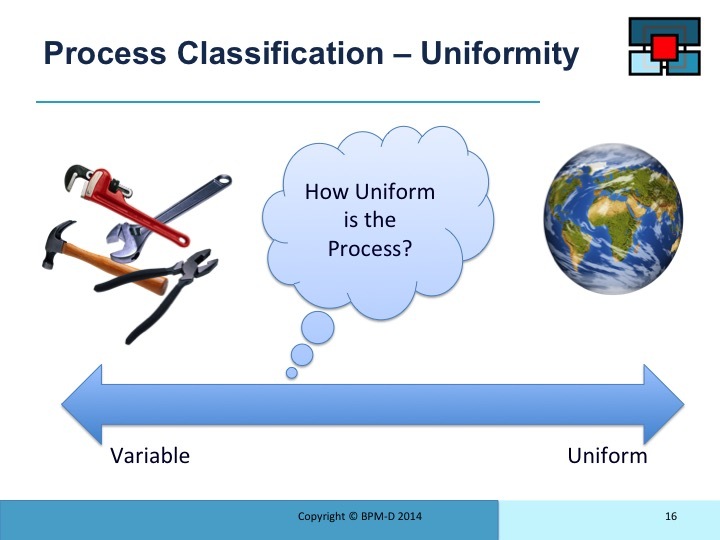 How uniform is the process across the organisation? How much “Franchise Variation” do we allow? Bringing these two dimensions together for each sub-process helps us identify the most appropriate governance and intervention approach. 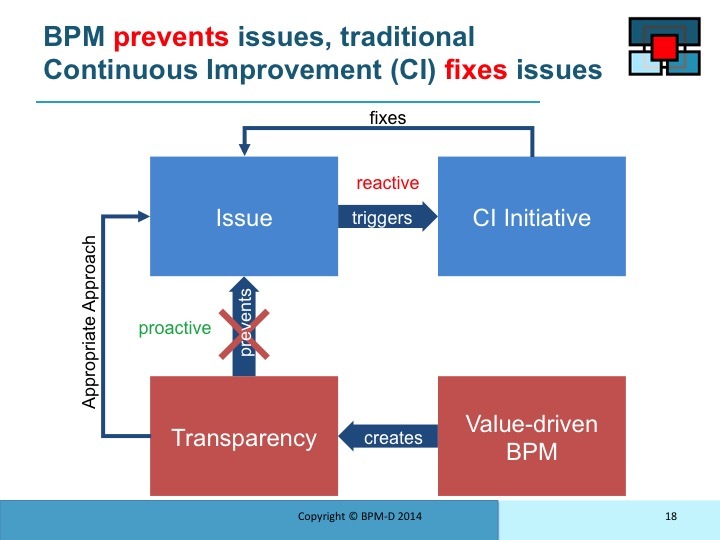 As with all other interventions CI has its place but is best executed within the context of a comprehensive BPM strategy. 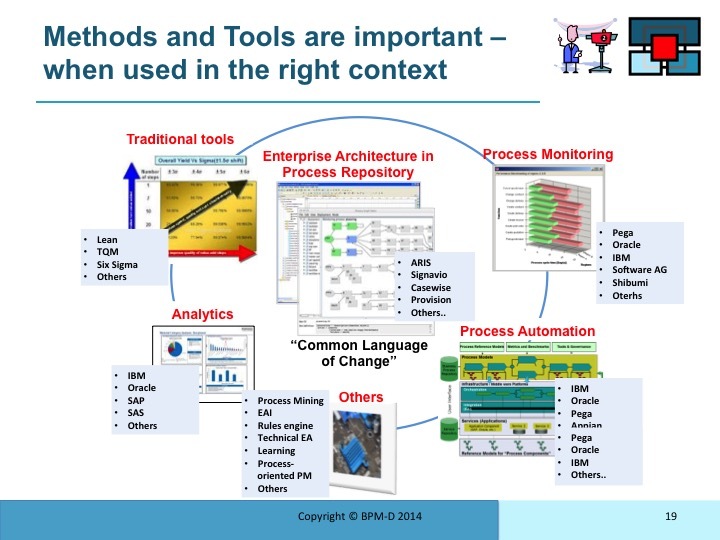 There is a wide spectrum of maturing tools and Methods.BPM is now well supported within the context of the BPM strategy. 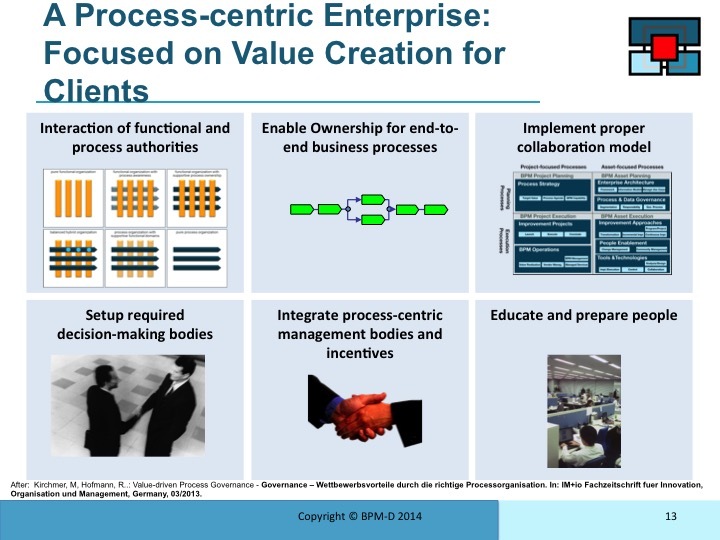 Remember to keep the value creation agenda as the prime driver rather than becoming a slave to any tool or technique. Central to a sucsessful BPM discipline is a processes repository handling the organisations knowledge capital about its processes. 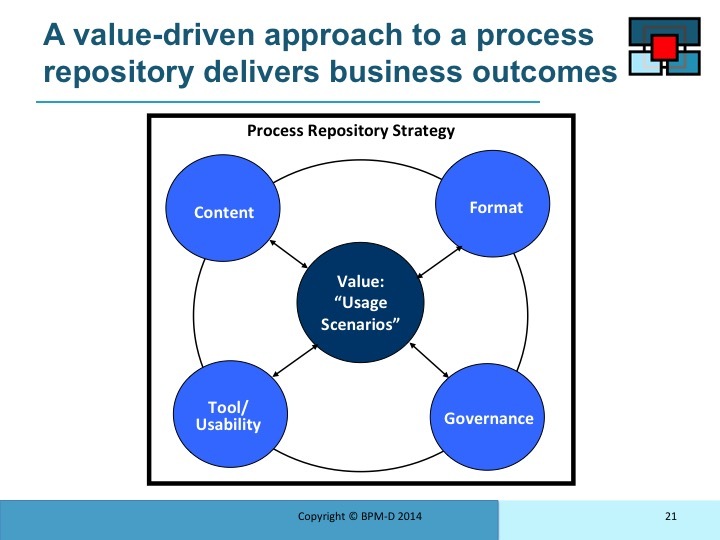 The process repository is most useful when it is anchored in the value outcomes. What will it be used for? With this in mind we can determine the most appropriate content, its format, the choice of tools and responsibility for maintaining it. 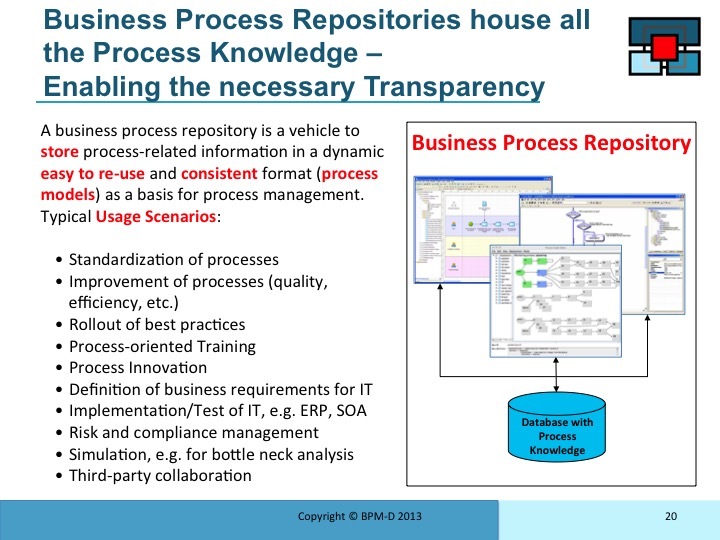 The content of the process repository needs to be carefully designed and structured. The most common components are shown on the diagram. 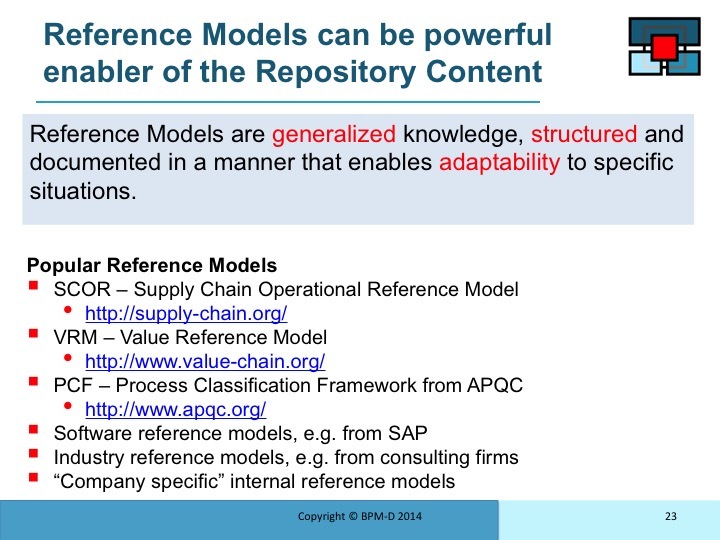 There are many examples of reference models that can help as a starting point for the structure and content of a process repository. 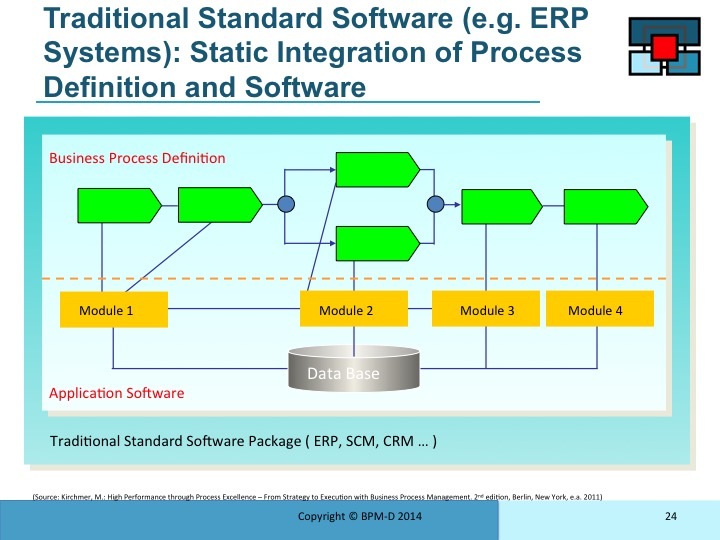 Moving from a process to technical implementation is historically a big challenge in process management. 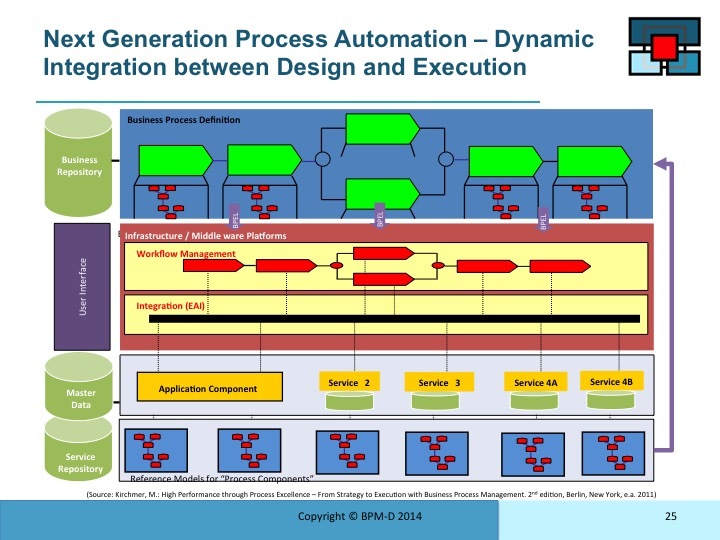 There are an increasing number of tools that can assist in process automation. 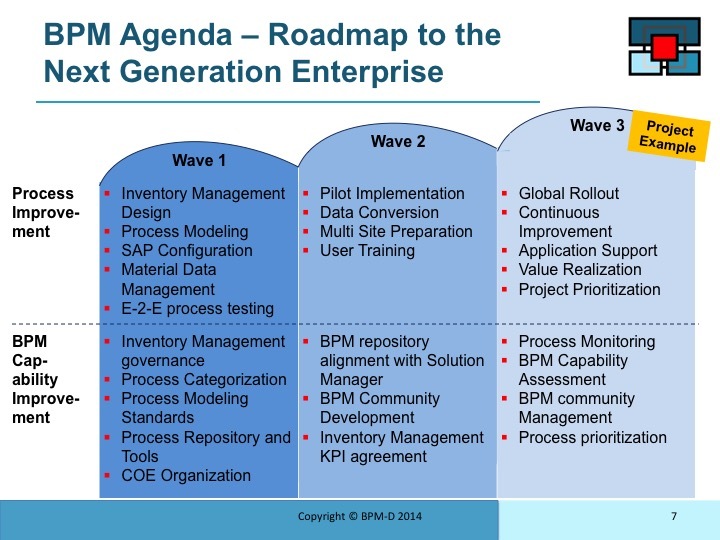 As with any other tool , these need to be properly positioned to meet the overall BPM strategy.